Before now social media platforms were just for sharing different things with your friends. Then you decided to look up your old friends from high school and added them to your social media accounts so you can easily keep tabs on who got a baby or who got engaged. Your parents or siblings got on social media, so you decided to add them as well. Then your boss or co-worker sent a friend request, and you thought it would be rude to decline it, so you ended up accepting it. Eventually, your social media account started looking more like a party among your friends and family, and also more like a sort of digital Rolodex for everybody you have met, or even for people you haven’t met before. The new Instagram era has changed sharing post and stories into a more guarded affair. You have the option of sharing a post on Instagram, but only to the extent you would be very comfortable with a relative, or an ex-lover, a coworker, or any other stranger seeing it. This means that you can share a post with only those friends you want to see it. As a result of this, Instagram has become less friendly. The communication tone has changed, and the line existing between follower and friend is blurred deliberately. Fortunately, Instagram has reintroduced and revived some of that lost intimacy. The Instagram social media platform has rolled out a new feature known as “Close Friends” which allows users to create a particular list of those followers they wish to grant special viewing access. When making a post on Instagram, users can differentiate between making a post for everyone to view and also making a post to a group of Close Friends. Instagram started testing this feature a year ago, starting with a smaller group of users. The company however then noticed that its users needed more controls over their followers. It also discovered that users like limiting their audience more in their Stories than in normal IG posts. This feature is similar to group messaging which can be used for sharing personal details, frustration at work, a new relationship, or any other things users may not want to share with their general audience. 2. From your feeds screen, tap on your profile. 4. Tap on close friends. 5. Tap on add under a user’s name and click on done when you are finished. In other words, it is now possible to share your posts and stories with a group of special users known as Close Friends on Instagram. This feature is available for all Instagram users. However, if you are doing it on a mobile device, you need to make sure the app is updated. While adding friends to Instagram close friends list, you will notice the close friends’ list is showing zero. Do not panic. 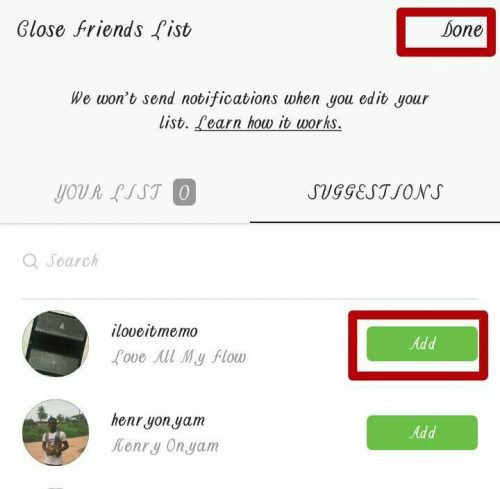 That is because close friends do not get generated automatically by Instagram, you have to follow the steps above to add friends to the list. Try this out and let me know what you think via the comment box. Thanks for stopping by.